The following is an interactive sermon I led at Clackamas United Church of Christ, near Portland, Oregon. 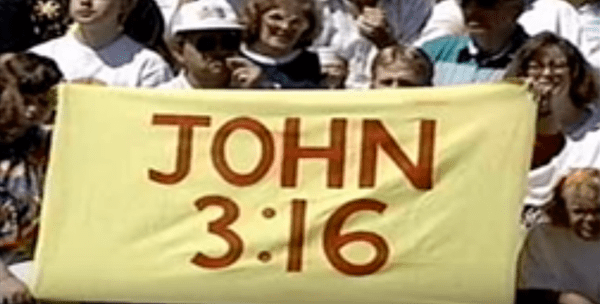 The congregation discussed the most famous Bible verse, John 3:16. The video recording of the sermon is below, along with my reflections. They say that familiarity breeds contempt. Maybe the most familiar verse in the Bible is John 3:16. You never see a sign for the verse that says, “Jesus wept” at football stadiums. Progressive Christians have become so familiar with this passage that we treat it with contempt. At least I do. Whenever I see those signs during a football game, I roll my eyes. The emphasis on belief troubles many Progressive Christians because it seems like we have to make an intellectual assent to certain Christian dogmas. But what if I told you that there’s a different way to interpret this verse? In the original Greek, the word for “belief” is pistis, which can be translated as “belief,” but it can just as easily be translated as “trust.” If we were to translate pistis as “trust,” how does that shift the meaning of the passage for you? Here it is in the context of John 3:14-21. Does the change from “belief” to “trust” change anything for you? For many, “belief” is the work of the head. It becomes a struggle for us to belief certain teachings about Jesus. Indeed, there may be teachings that are good, but for some reason our minds are not willing to accept them. Or there may be teachings that aren’t good, and our minds protest against them precisely because they are bad teachings. But when we switch to trust, our minds can relax a bit more. That’s because trust isn’t so much the work of the head, as it is the work of the heart. Trust in Jesus is about following him. It’s about imitating his life. But what about this condemnation business? There seems to be a tension in the passage. God didn’t send Jesus to condemn the world, but to save it. But then it says that those who do not trust in Jesus are already condemned. What is that about? For the Gospel of John, what we say about Jesus we can also say about God. God didn’t send Jesus into the world to condemn it. Why? Because God doesn’t condemn anyone. God loves the world. God doesn’t condemn the world or anyone in it to hell. But the passage clearly states that some are condemned. But who is doing the condemning? Not God. We are already condemned because we condemn one another. When we choose the ways of evil and darkness and violence, we condemn others and ourselves to imitative acts of reciprocal evil and darkness and violence. The truth according to John 3:16 is that God doesn’t condemn anyone. We condemn ourselves. The only question left for us to answer is if we trust and follow Jesus in his radical commitment to God’s nonviolent, universal love. For it’s in God’s nonviolent love where we find eternal life.